BRENTWOOD, Essex, UK, 14 October, 2015 – Ford’s all-new Focus RS has raced up to 1,500 orders from UK buyers without a single test drive being taken. In the month before prices and specifications were announced at September’s Frankfurt Show, 500 Focus RS fans had already paid deposits to secure the first cars. Since then Ford dealers have logged a stream of 1,000 further prospective buyers keen to be among the first to take delivery from Spring. Since the wraps first came off the 165mph Focus – the fastest-accelerating model ever to carry the famous RS badge – Ford dealers have been deluged by prospective purchasers keen to be among the first to take delivery. Though the all-new Focus RS features an extensive list of standard equipment, not least a specially engineered version of Ford’s new 2.3-litre EcoBoost engine delivering a maximum power output of 350PS, there is a comprehensive array of optional extras available. “These enthusiasts are taking great care in building their optimum specification,” said Andy Barratt, Ford of Britain chairman and managing director. There is a choice of five different colour finishes, including Metallic and Mica options. 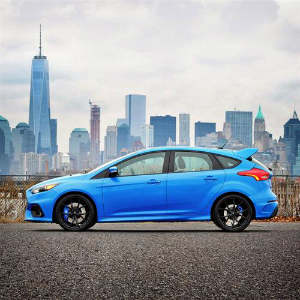 The all-new Focus RS, which has a recommended on the road price of £28,940, is a technological powerhouse featuring Ford Performance All-Wheel Drive with Dynamic Torque Vectoring and Launch Control technology which delivers 0-62mph acceleration in just 4.7sec. While the new all-aluminium 2.3-litre EcoBoost engine shares its fundamental structure with the four-cylinder engine in the all-new Ford Mustang, it has been upgraded for the Focus RS to deliver 10 per cent more power. The engine features a new low-inertia twin-scroll turbocharger with larger compressor, enhanced air intake design, and a large-bore high performance exhaust system. Standard equipment includes 19in multispoke alloy wheels, 350mm ventilated front disc brakes, RS performance rear spoiler, twin high-performance exhaust, Bi-Xenon headlamps, Recaro front seats, dual-zone electronic temperature control, heated windscreen and washer jets and a Thatcham Category 1 alarm system. Ford of Europe is responsible for producing, selling and servicing Ford brand vehicles in 50 individual markets and employs approximately 53,000employees at its wholly owned facilities and approximately 67,000 people when joint ventures and unconsolidated businesses are included. In addition to Ford Motor Credit Company, Ford Europe operations include Ford Customer Service Division and 23 manufacturing facilities (15 wholly owned or consolidated joint venture facilities and 8 unconsolidated joint venture facilities). The first Ford cars were shipped to Europe in 1903 – the same year Ford Motor Company was founded. European production started in 1911.